Living in the suburbs of Detroit, you learn as you grow up that everything is oriented towards the auto business. Schools design curriculum specifically for jobs in the Big 3 or their suppliers. You also quickly learn that everyone has brand allegiance based on their families. How difficult it must be to buy cars when you don’t feel obligated to buy a certain faction of the auto industry. My dad worked at GM for 25+ years and so I find myself in the camp of Buick, GMC, Chevy, etc. I don’t purport to be a “car guy”, a lot of them look like the same thing to me. Luckily I have great friends that help explain all the nuances to me. This is why I don’t like going to the auto show alone. So I was really pleased when Dan asked if I wanted to go check it out with Jonathan. I just mostly go look at how pretty the new models are with a primary interest in the concept cars and the new technology that’s being focused on that particular year. This year that technology was Liquid Hydrogen Fuel Cells. I remember when fuel cells were supposed to electrolyze water into hydrogen and oxygen. Then you would burn the hydrogen to fuel the combustion and the exhaust would be oxygen. 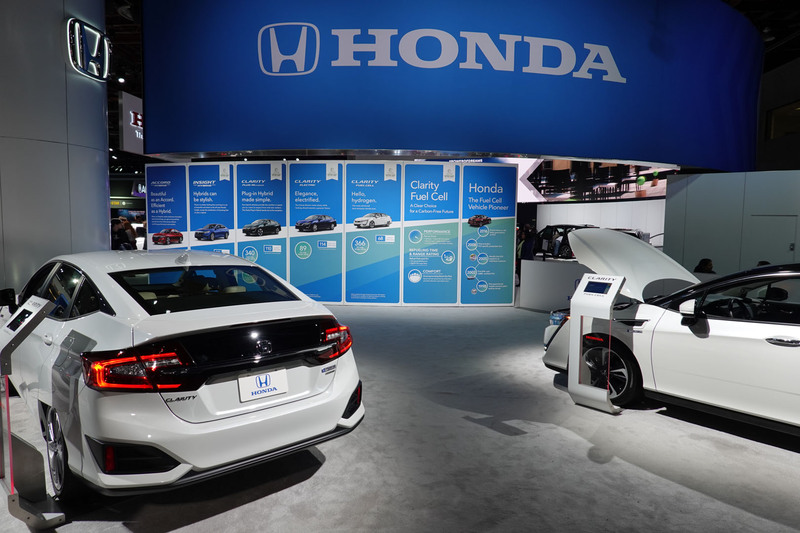 Based on what I was reading at the auto show, it looks like we’re just skipping the water part and going straight to the hydrogen. While I think it’s a good idea, I feel like there’s no infrastructure set up for it and I don’t really see it taking off. But who knows? I just see the lack of E85 when that was supposed to be the next big thing. They’re even offering an incentive for the purchase of liquid hydrogen cars with a $15,000 gas voucher? Either that’s going to be a tremendous amount of hydrogen, or the hydrogen is going to be ridiculously expensive. I guess we’ll see. The march of progress continues on. KIA was aggressively marketing their Telluride compact SUV. They had an enormous little obstacle test track set up so that people could drive or ride along in the car while it went through the bumpy track. I’ve never seen so much space taken up by a company before, nor such an elaborate “booth”.